American birch, the state tree of New Hampshire, is also known as American white birch, paper bark birch, marsh birch or canoe birch and is commonly found throughout North America. The bark of the American birch is its most significant characteristic. It peels in large sheets that resemble paper. American birch is very abundant and was used by Native Americans to make a variety of items, including canoes. Its tall, upright appearance and striking bark make it a popular landscaping choice. American birch leaves are from 2 to 4 inches in length, oval, with a pointed tip and slightly toothed margins. They are medium green in color, turning a bold yellow color in autumn. The flowers of the tree, known as catkins, are green or brown and inconspicuous. The fruit is a slender, brown cluster of seeds about 2 to 3 inches in length. The bark of the tree is bright white and peels naturally from the tree in sheets during normal growth. The tree is usually tall and upright in shape with a slender, oval appearance and can grow to over 75 feet tall and 30 feet wide. Mature American birch have a relatively dense canopy with a medium-fine texture. American birch usually form multiple trunks on a tree, although a single main leader trunk is not uncommon. The branches tend to hang toward the ground. 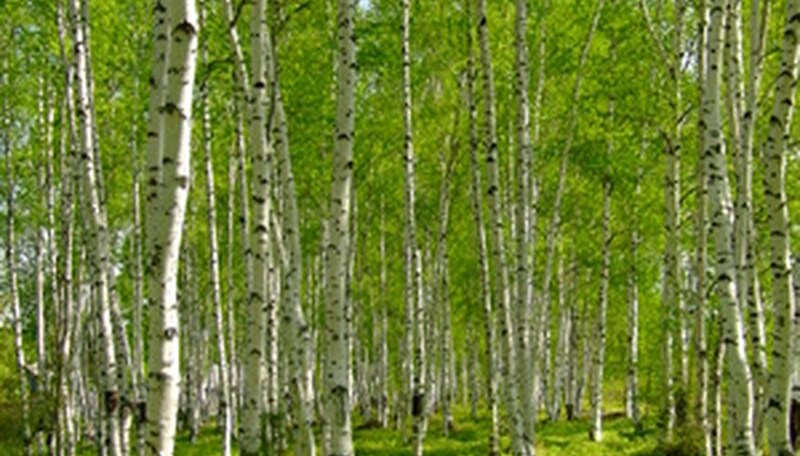 American birch grows fairly quickly, over 2 feet a year in optimal conditions. The tree grows well in hardiness zones 2 through 7. American birch tolerates cold better than most trees and will keep its leaves longer into the cold season than most trees. Because the tree tends to produce multiple trunks, it often is found growing in large stands. American birch prefers full sun, though it can also grow well in partial shade. The tree also prefers soils that are somewhat alkaline and wetter than most. It is also drought and salt tolerant. Young American birch trees are easy to transplant and can be commonly found in nurseries and garden centers. Water new trees regularly until well-established. A common ornamental, American birch is often placed as a specimen tree in the landscape. It is prized for its white bark and bright yellow colors in the fall. The wood of the American birch tree is hard and light in color with a tight grain and is used for furniture, veneers, carvings and other wooden products. Traditionally, the bark was peeled from the tree in large sheets and made into canoes and homes by Native Americans.